A troop leader shares how your girls can have fun earning the Good Neighbor Badge. Our Daisy troop is a Kindergarten troop in Maryland Heights, MO (a suburb of St. Louis). We earned the Good Neighbor Badge. We always start our meetings with an activity that the girls can start on while the other girls are arriving. With that idea in mind, we started off with Step One, Explore Your School. We used the page in the handbook that had several circles on it. On this page the girl drew herself in the middle circle and then drew pictures around the circle of ways that she is a good citizen at school. Some of the girls were done early so they used the back of the paper to draw a favorite place in their school. Our troop has some girls that go different schools and a couple girls who homeschool so it was great opportunity to compare and contrast our different schools! After each girl had arrived we recited the Pledge of Allegiance, the Girl Scout Promise and the Girl Scout Law. We use a song that we play off of YouTube to learn the Girl Scout Law. The girls enjoy it because it ends with a little dance break! Then we went over our caper chart and each girl’s responsibilities for that meeting. Next we completed Step Two: Discover Your City or Town. Using a map of our area, we made up a diagram of some of the major streets in the area by putting down painter’s tape on the floor. 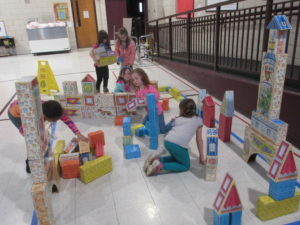 Then we used large cardboard building blocks to build our school, city hall, the community center, the library, the pool, and the grocery store. The girls also enjoyed figuring out where their homes and some of their other favorite landmarks were on the map. After we had built our town, the girls each got to decorate “steering wheels” cut out of paper plates with crayons and stickers. 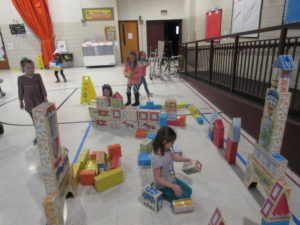 They then got to take their steering wheels and “drive” around the town we built. They loved this game and got to take turns playing traffic cop and saying red light, green light. We did a few activities for Step Three: See What Makes Your State Special. First, we looked at the map of the United States. We found Missouri and the capital, Jefferson City. The girls each talked about their favorite things about Missouri, and St. Louis and what they thought people should see when they visited the area. The girls then got to enjoy a snack of Gooey Butter Cake, a St. Louis specialty. While they ate their snack I read to them about Susan Blow. Susan Blow was an educator who was born in St. Louis in 1843, and who opened the first public Kindergarten in the United States. We looked at pictures of her, her first school, and her grave. 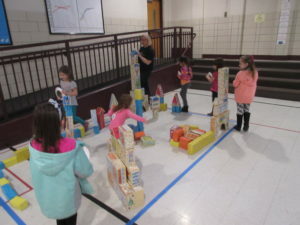 The girls enjoyed hearing about her, because she was from the area and they felt a connection to her because they are in Kindergarten. We talked about in what ways Kindergarten was the same in that time and in what ways it was different. They even expressed interest in visiting her first school, which is now home to the Historical Society. After this, the girl got into their closing circle to sing “Make New Friends” and to do the Girl Scout Squeeze. I think that they really enjoyed taking the time to learn and think about their community. 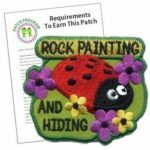 The Rock Painting And Hiding Patch Program or Kindness Rocks from MakingFriends®.com are great projects for your girls to do in their community after earning the Good Neighbor Badge. DebE Martin is a Troop Leader for GSEM Daisy Troop 884. 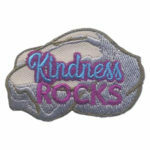 She is happy to be sharing her first blog through Girl Scout Leader 411 MakingFriends.com and looks forward to sharing more ideas here.